The State House Commission in June 2004 approved an application requesting the removal of statutory Green Acres restrictions, paving the way for Union City to demolish the Stadium. Built by the Works Progress Administration (WPA) in 1937, the Art Deco style Roosevelt Stadium was designed by Walther Mahnken. It was built of stucco-sheathed bricks that came from two nearby schools that had been demolished recently. It features piercing vertical rays, winged figurines, and diamond flourishes. Along with the nearby Sears & Roebuck tower, the stadium, which was refurbished in 1985, created an Art Deco corridor in Union City. 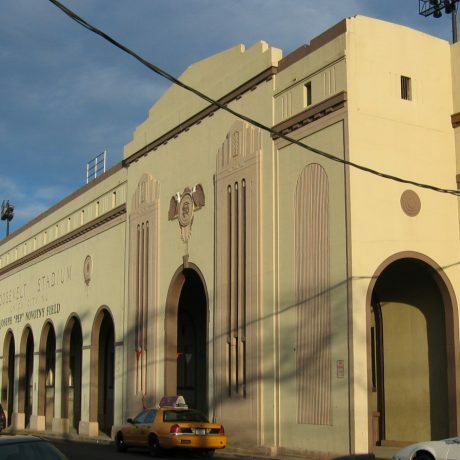 Despite its iconic importance to Union City, Roosevelt Stadium could become a casualty of the State’s program of new school construction. It is slated for demolition in favor of a 250,000 sq. ft. high school for 1700 students and an accompanying one-story gym, auditorium, and cafeteria structure that will support a new football stadium on its roof. Beyond the loss of an iconic element of Union City’s identity, PNJ has two problems with this plan. First, Green Acres money was used in renovating the stadium and adjacent four acres of open parkland. Union City is now asking DEP to remove Green Acres restrictions from the site so it may replace the city’s only large area of public green space with a building that will be covered with artificial turf to which access will be restricted. Secondly, this site near the Hackensack River was an area of Lenape Indian habitation. During excavation for the original Stadium construction native projectile points were uncovered. Further demolition and construction will needlessly disrupt the archaeological remains. There must be a smarter way than this to meet our pressing educational needs.